State witnesses took the stand Tuesday on the second day of the trial for Timothy Danforth, who is accused of shooting Michael Reis. FARMINGTON — A 19-year-old man testified Tuesday that when he went to a Wilton golf course to meet up with Robert Danforth and his son, Timothy Danforth, the evening of May 31, 2016, he had a pair of brass knuckles in his pocket. 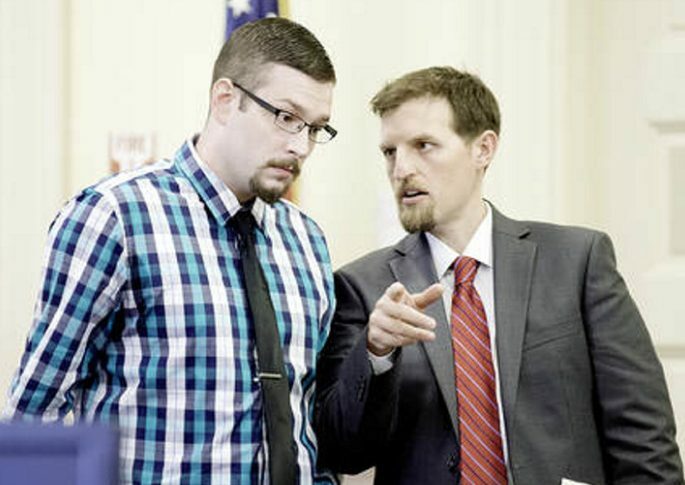 The state called Zachary Uhlman, 19, of Wilton, Gary Brosius, 24, of East Dixfield, and Kayla Gordon, 27, of Wilton to the stand Tuesday during the second day of Timothy Danforth’s murder trial. Danforth, 25, formerly of Wilton, now of Farmington, is accused of shooting Michael Reis, 24, of New Sharon, three times with a shotgun June 1, 2016. Danforth’s co-counsel Sarah Glynn said in her opening statement to the jury Monday that this was a case of self-defense — defense of family and of property. Uhlman, Brosius and Gordon gave statements that conflicted with what they said to police during interviews in June 2016, according to playbacks of the interviews. They also gave statements that conflicted with each other’s testimony Tuesday at Franklin County Superior Court. Uhlman said he and four other men including Reis, Brosius and Matthew Kerr of New Sharon went to the golf course on Weld Road in Wilton and waited for the Danforths the evening of May 31. Uhlman said he planned to meet with the Danforths to either set up a payment plan for the ounce of marijuana for which he owed Robert Danforth, or take a beating to get it over with. Gordon testified that she dropped Uhlman and Brosius off and waited on Colby Miller Road, a short distance away. Uhlman testified that he stood alone at the golf course while the others stood back about 100 to 150 yards so that if he got too beaten up they could step in and try to stop it. Gordon testified under questioning that she did not want to drive the men but they threatened to steal her car if she didn’t. She also testified she was asked to drive by the Danforths’ residence that evening and to let Brosius know when the Danforths were outside. Uhlman testified that he felt responsible for Reis’ death because if he had paid the $200 for the marijuana, it wouldn’t have happened. He spent the money on rent after Brosius lost his job, he said. Both Assistant Attorney General Robert “Bud” Ellis and Danforth’s co-counsel Jeffrey Wilson went through phone texts among Uhlman, Brosius and Robert Danforth, age about 50, of Wilton with Uhlman and Brosius. The “war of texts” began early afternoon on May 31 as Brosius, Uhlman and Brosius’ mother were in Massachusetts on their way back from Pennsylvania. Brosius received a text from a friend telling him that Timothy Danforth had asked a younger friend if he knew Zachary Uhlman and to tell him he was going to get hurt if he didn’t pay his father. Danforth had a gun on his hip and made it visible to their friend, Uhlman said. Both he and Brosius got upset and angry that Danforth had confronted the teenager, Uhlman said. There were attempts to set up meetings with Robert Danforth by text and by phone calls at a Main Street residence, Food City, Pond Road and the golf course, all in Wilton. Robert Danforth texted for them to come to his residence on Weld Road in Wilton. Wilson said Uhlman called Danforth 67 times, three minutes apart, between 10:30 p.m. May 31 and 12:30 a.m. June 1, but Uhlman said it was 20 to 30 times. After the Danforths didn’t show at the golf course, Uhlman said he tried to get their attention — their home was a short distance away — by yelling that he was there in two different places. Uhlman and Brosius testified they heard several shots, but they didn’t think it was a real gun. They thought the Danforths were trying to scare them. The group went to the Danforths early June 1. The car was parked on the road back from the driveway. Kerr had told them he knew the Danforths the best and would try to mediate the situation, Uhlman, Brosius and Gordon testified. They watched him walk down the road toward the driveway but couldn’t see him for the most part once he turned into it. They testified they heard a shotgun blast seconds later. Reis got out of the car and walked down the road toward the driveway because he told the others he was not leaving Kerr there. Uhlman and Gordon testified that Reis had his hands up. A short time later they heard three shots, then heard Kerr screaming that Reis had been shot. Kerr got Reis to the end of the driveway and was kneeling, holding him in his arms, Brosius said. Brosius said he lifted Reis into his arms and carried him to the car to get him in the back seat. Uhlman testified that he was trying to keep Reis’ head still and was squeezing Reis’ neck and chest where he thought blood was coming from. Brosius was holding Reis’ thigh tightly to try to stop the bleeding and Kerr was trying to give him mouth-to-mouth resuscitation, Uhlman said. Ellis said in his opening statement Monday that Reis was shot in a toe, the second shot was to the thigh and the third shotgun blast was to his shoulder. Uhlman said no one had a phone as they rushed to the hospital and they didn’t stop at the Wilton Police Department because they didn’t think Reis was going to make it. When they turned onto Routes 2 and 4 near the bowling alley toward the hospital, Reis’ head dropped to Uhlman’s shoulder and he took his last breath, Uhlman said as he wiped tears from his eyes. They made it to the hospital and were told later that Reis hadn’t made it, he said.